The 2014 Nissan Rogue is the first vehicle to utilize the new jointly developed Nissan/Renault Common Module Family (CMF) platform architecture. The added efficiencies provided by the joint development allow Nissan to deliver unprecedented value in the segment. I was on hand with Nissan at the 2014 Frankfurt Motor Show as CEO Carlos Ghosn unveiled the all-new 2014 Nissan X-Trail that will be sold in Europe. 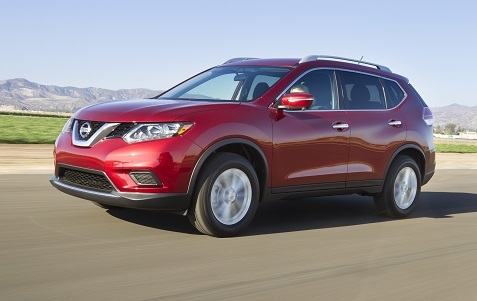 Shortly after in the U.S., Nissan unveiled the 2014 Nissan Rogue that will be sold in the United States. The Rogue and X-Trail have been completely redesigned as you can see from the photos above with a more muscular look that incorporates new design elements like available LED headlights and standard LED signature daytime running lights. All new headlamps and front grille replace the harder edges of the front facia of the current model. The high, muscular ridges along the wheel wells also enhance the styling of this compact CUV. – A number of Nissan technology features are available to aid the driver, including Around View Monitor with Moving Object Detection, Blind Spot Warning, Lane Departure Warning and Forward Collision Warning. Seeing this new model up close I was impressed with how it looks from every angle. The compact CUV market is large and growing but it’s also very competitive, so the redesigned Rogue and X-Trail will be critical for Nissan to keep and grow its market position. Check back later this year as we’ll share our driving impressions once we get the chance to try out the Rogue on the road.